If you are looking for a Pouch Laminator, you have come to the right place. MyBinding.com carries a huge selection of pouch laminators for almost any project. Whether you are looking for a small 4" model for laminating ID badges or nametags, a medium sized unit for laminating letter or legal sized documents, or a large commercial duty system capable of laminating menus and small posters, we have them all. Check out the full line of GBC HeatSeal and Akiles Pro-Lam laminators as well as awesome options from other manufacturers including Fellowes, Royal Sovereign, Tamerica, Lamitek and Black & Decker. Browse our selection and find the right machine for your needs. Just don't forget the pouches! Lamination Speed: 14" / min. Lamination Speed: 26" / min. Welcome to MyBinding video. Pouch laminating is so very simple and economical, it is the first choice for many people. Here at MyBinding.com, we have every kind you could possibly imagine – from small ones to large ones, from personal and home application to large business, industrial application. We have a number of specialized laminators that can handle heat-sensitive documents or use heat as a tool, for instance, for photos or foil lamination. As you shop around, take notice of the size of the laminator. You want to make sure it’s big enough to accommodate your size documents you’ll be using. You also want to see just how thick a pouch that particular laminator can handle. And take a look at the controls to see just how flexible they are, what they can do and how easy they are to use. 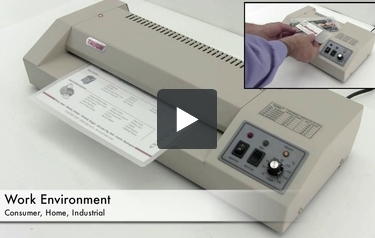 And we carry laminators that are single-button push all the way to those you can program. And here at MyBinding, you’ll find that we have a video for almost every product that we carry; at least, that’s our goal, so you can see in action, in demonstration the product that you’re going to buy. And we have a dedicate phone and instant chat team to help you with any question you may have. When image matters, MyBinding.